My appetite had vanished. All I felt was a vast pit in the bottom of my stomach. Which was understandable considering what I had just been through. Not even a week earlier, I had lost my long-term boyfriend to suicide very unexpectedly. I was in shock, as well as having to manage overwhelming, tsunami waves of grief. Everywhere I went, from the wake to the funeral to spending time with my family, everyone kept trying to feed me. And I tried so hard to drum up the appetite to take care of myself. It was a challenge. Out of the blue, I get a text message from one of my late boyfriend’s colleagues, who we had done a Whole30 round with earlier in the year. The Whole30 is a popular elimination diet where participants agree to not eat processed foods, sugar, dairy, grains or legumes for 30 days, which on the program is called a “round”. Once completed, the eliminated foods are re-introduced over the following two weeks to determine if any prior negative health symptoms were a result of your diet and what you chose to eat. The colleague apologized for the unannounced text and cited he asked around to get my contact information. He wanted to do a Whole30 round in memory of my boyfriend and wanted to know if I could help. As a Whole30 veteran who has completed the program numerous times over the course of 7 years at that point, I had helped several people complete their own rounds. One of them being my boyfriend. He and I had done the January 2018 Whole30 together as a couple. Over the course of that round, he lost 40 pounds, improved and later eliminated his insomnia, got rid of diverticulitis flare-ups, and increased his energy and overall mood. After his success, he started preaching to everyone around him that they needed to try the program, which then resulted in people requesting to join us the next time we did one. This colleague was one of those people. While I was initially flattered he wanted to honor my boyfriend in this way, I was hesitant. I wasn’t sure I was able to handle the commitment to the program with my emotions still being so raw from what had happened. The Whole30 was something my boyfriend and I shared and used to help us grow closer together in our relationship. I’ll never forget all the “awes” that ensued the first time he met my family. While out to dinner with them in the middle of our first round together, my Aunt asked why he’d willingly sign up to do such a restrictive program with me. His answer was “I wanted to experience something with Corrie that was good for our health, challenging and would bring us both closer together”. Remembering that made me realize, that the best act of self-care I could do for myself in grieving the loss of the love of my life, is to do the very activity he valued in bringing us closer together. So I agreed to start paying attention to what I was choosing to eat and participate with my boyfriend’s colleague in a Whole30 round in his memory. So then I had to actually do the work and complete my round. 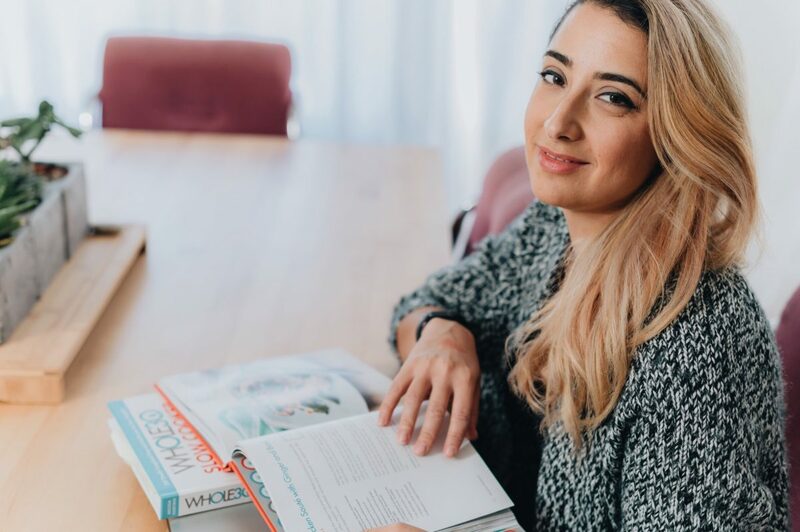 Here are my key takeaways I learned from utilizing the Whole30 program to love and care for myself while I managed my grief. When I started my Whole30 Round I still had no appetite. But I had invested the time to meal prep and stock my fridge and pantry with healthy and complaint options. I made a promise to myself that even if I didn’t finish my meal, I’d at least make it a point to sit down and attempt to have three square meals a day. Having the structure helped me make sure I was at least getting some fuel into my system until my appetite returned. As the days and weeks went on, I found my appetite starting to return back to normal. I’ve also while on prior rounds experienced I was snacking all the time prior to starting it. The structure of the program really helps you become more mindful of when you eat and if you are satiated or not. Since snacking isn’t allowed, it helps you curb emotional eating and ensure that you are feeling full after your three square meals a day. The saving grace of doing the Whole30 Program right in the thick of my grief is that it really helped me come face to face with my feelings about my loss. I couldn’t just eat a cookie to feel better or have a cocktail to take the edge off. It was just me and my thoughts, which was the very best thing for me. By not being allowed to run from them, I was able to process and release them in a much quicker manner than if I was self-medicating. My body was being ravaged by stress and a lack of sleep. By fueling it only with natural, unprocessed foods I was able to give it the support it needed to begin healing. Every time I went to eat one of my pre-prepared meals, I felt this feeling of confidence that I was treating myself the best that I could during this difficult time. That alone made me feel good. My insomnia prior to my round was so bad I had to be medicated to go to sleep. I didn’t want this to continue long-term, and luckily about 5 days in I started experiencing much better sleep. This allowed my body to start to recuperate from the trauma and my health to start to return faster. By the time I hit the “Tiger Blood” stage in week three, I was physically and mentally feeling amazing. I felt mental clarity, as well as a surge of energy which helped motivate me to keep moving and doing things. While my grief was still there, in the times that I wasn’t experiencing a wave of it I was actually starting to feel like my normal self again. Since I was more focused on accomplishing my goal day by day, I started to lose track of exactly how long he’d been gone. It made surviving that first, crucial 30 days so much more manageable. Because every morning when I woke up I had something simple, easy, and personal I was trying to accomplish for myself and my health. While I had done countless Whole30 rounds prior, this one was the most meaningful for me. It really taught me the incredible value of self-care. By focusing on myself daily for 30 days, and how I was fueling my body and managing my feelings and emotions, it helped me emerge a better person. I also gained several new friendships out of the experience from all the acquaintances, including my boyfriend’s colleague, who offered to join me. I had gained clarity on what our relationship meant to me, what I need self-care wise to thrive, and I literally looked and felt better than I did before my loss. At a memorial fundraising event several weeks after my round, I received more comments on my appearance and how well I seemed to be doing than I could count. Each comment started with “Are you on Whole30 again? Next time I’d like to try it with you… you look fantastic!”. As I prepare to love and invest in myself yet again for my 2019 January Whole30 Round, I want to continue sharing this life-changing experience with others like I had shared it with my boyfriend. This go-around I’d like to share it with you. I invite you to join me for my 6-week, Whole30 Group Coaching program that I’m running from December 27th- January 31st. During the program, we’d be experiencing the Whole30 together side by side and providing support and accountability to each other along the way. To learn more about the program and to register, click the button below. If you’d like to try a Whole30 round by yourself, the program is free and you can find all the information on their website. If you participate, be sure to tag me on Facebook, Instagram or Twitter, I’d love to hear about your experience with the program. This entry was posted in Health & Wellness, Self-Care and tagged grief, group coaching, self-care, self-love, whole30.